With a bearish market pattern continuing to emerge, we have to be ready to roll with the punches as best we can and use whatever momentum we can find, whether it’s upward or downward. Traditionally, the SPY has been our go-to in these kinds of instances. It was just Tuesday morning that we signaled a range of five SPY Calls, which all produced big-time gain opportunities this midweek, ranging from 184-245% Now, with the markets looking to pull back once again, we’ll hop right to the other side of the fence and zero in on some SPY Puts to close out the week. The targets that we’re going to be monitoring today are going to be the SPY Weekly $263.50-262 Puts*, which should work out nicely for possible quick-strike daytrades in the event that the premarket trends we’re observing do persist. *NEVER trade options with a weekly expiration on a Friday unless you are an advanced level trader working with disposable funds. Blue Horseshoe Stocks: Options Mania! We’re returning to CGC to update on new highs for the third straight trading day this morning. Originally put out on Wednesday morning, we have been tracking the CGC 09/21 $30-40 Calls to some fantastic gains ever since. As of yesterday morning, our overall observed gains on those three contracts were 338%, 596%, and 994% respectively. Following another big day, those figures have been extended by an impressive margin once again. We originally alerted on PTOP on the morning of November 8th, well before the huge run that the stock would launch into weeks later on the back of bitcoin-hysteria. Our observed low on this crypto-related play was all the way down at .0004. Flash forward to this week, and PTOP has been launched to new highs as Bitcoin itself continues to set new all-time highs, this morning hitting $11,855.73 shortly after 8:30am eastern. Yesterday the stock hit .014, marking a 3,400% increase from our witnessed low, in a matter of just twelve trading days! We signaled DPW, another crypto play, in yesterday mornings premarket report, and it too surged to new highs with the help of the continued bitcoin explosion, as well as the company’s unveiling its subsidiary’s plans to launch a line of line of advanced hardware for digital mining of cryptocurrencies, including Bitcoin. Our call came just in the nick of time for us to catch a very solid intraday run from DPW, which traded up from a low of 2.15 to a high of 3.49, recording a 63% intraday push to the upside. It’s also closed at its high of day on heavy volume./ Coupled with this morning’s new all time highs for Bitcoin, and we have the conditions necessary for this stock to continue its bullish ways. After realizing that EGBN had been the target of short-seller manipulation, we reported this to our readers yesterday morning, and placed the EGBN 12/15 $50-60 Calls on watch “for what should be a forthcoming recovery”. We’ve already seen our take on the situation vindicated in one session, as the stock rebounded predictably after having taken a nosedive on Friday. We initially placed a pair of options ideas for ANF on watch in our premarket report Thursday, highlighting the ANF Weekly $10 & $11 Calls. We saw multi-bag moves in those contracts that day, and Friday morning, we noted yet another premarket gap-up from the stock, mentioning that we would continue to track for more gains. We went very options-heavy in our reports throughout last week, and another idea that bore fruit on Friday was one we formulated on Tuesday morning, with the DSW 09/15 $17.50 & $20 Calls. In this case, the $17.50‘s were as low as 1.15 after our signal, and closed at 2.72 on Friday, marking a four-session swing of 137% The $20′s ran from .30 to as much as .80, for a 167% move. There’s still plenty of time before expiration on these contracts, so we won’t rule out seeing further positive activity in the days and weeks ahead. To keep this options train chugging down the tracks, we’re going to highlight a range of contracts in the AMZN chain. AMZN stock itself has been under consolidation and is presently sitting around an area of previous support. A lot of eyes are on the company as well as its first day as the official owner of Whole Foods brought sweeping price cuts at the high-dollar supermarkets. We’re going to look to the AMZN 10/06 $965-980 Calls for an extended term idea, which could yield significant gains once a reversal occurs on the chart. 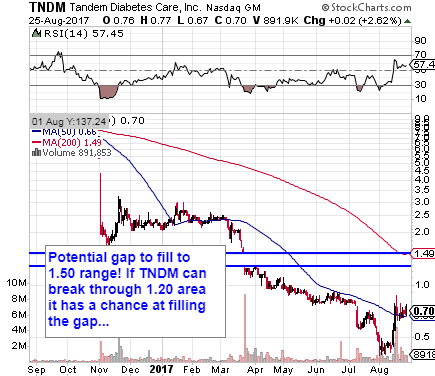 We also want to place TNDM on watch for the reasons outlined in the annotated chart below. The stock cracked its 50DMA last week after recently having fallen to new lows, so we want to put in on the radar for a potential recovery play.